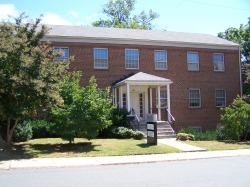 My office is located on the first floor of the Maplewood Building (pictured at left) in Charlottesville, located at 404 8th St. NE. (Charlottesville, VA 22902). Look for the Roy Wheeler Realty sign outside the building and my name on the sign just beneath it. Free parking is provided in the lot on either side of the building. 8th St. NE intersects both High St. and Market St. just off Charlottesville's Historic Downtown Mall. Link to www.googlemaps.com or www.mapquest.com here. I see clients by appointment only, and offer Healthcare ﻿Professionals Recovery groups on Thursday mornings, composed largely of participants in the Virginia Health Practitioners Monitoring Program (HPMP).